Winter is hard on your car. Snow, ice, temperatures, and road salt all work together to give your beloved car a sub-zero assault. Your car’s body, windshield, mirrors, wipers, tires, and gas tank all take a big beating from November to March. 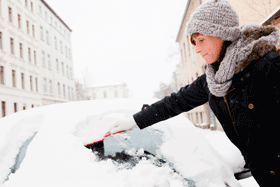 Here a few things you can do to keep your car on the road and in one piece throughout the long, cold winter. On rare warm winter days, take advantage of what the world offers. Get your car washed. The salts they throw all over the road to beat the snow are designed to eat away at physical objects, and the city government— focused on street safety, first and foremost—doesn’t care too much about potential car rust. Salt eats your car’s body the same as if it were snow. Your car’s insides—seat covers, floors, etc.—are also at risk. You need to get it off. The carwash can busy on these nice days, but it’s the worth the wait in the long run. And don’t forget to spend the extra two or three dollars for the undercarriage wash! If the temperature is too low, a car wash can be a bad idea. While serious damage is extremely unlikely, you could potentially freeze your doors or keyhole shut, or your windshield wipers down. Of course, if you’re lucky enough to have a garage to park in, there’s less of a problem. If you’ve got a garage, count yourself as lucky. Indoor parking keeps precipitation off your body. It also prevents your car from being in danger of being hit by spinning out motorists and snowplows. Parking indoors could put years into your car’s life. And if you haven’t got a garage, see if you can find an alternative indoor spot. Many places have space available for rent. If you’ve got the cash, it might be a worthwhile way to spend it. It’s not only your car’s body that needs to be kept clean in the winter. Your upholstery, your floors, and anything else you keep in your car could be damaged by the non-stop salt and water that winter weather and its clean-up brings. Vacuum your car out. Get a professional to give it a thorough cleaning every now and then. Buy a protective mat for your floors to keep them from getting all crusty and smelling like salt. Repairing the insides of your car can be costly. Prevention is your best bet for a long lasting interior. You want the insides clean. After all, it’s where you spend a good deal of time. This may not sound like a cleaning and maintenance issue, but it is. Reckless driving, particularly in winter, is a major cause of accidents. And—safety aside—accidents can damage your in ways aside from the obvious. Even a minor dent can open a path for rust and filth to creep into your car’s body. A crack in the windshield can expand as moisture gets in and expands with the cold. Avoid the need for these costly repairs by driving even more slowly and carefully in the winter than you do normally.